So you're on the bank of a beautiful running stream, and the trout are feasting on scuds, mayflies, and caddis that float downstream. You spot a small group of medium sized rainbows across the water against the other bank under a fallen tree limb. You can see them attacking the surface for food, and you KNOW you have to get your line over there. It is too far to cast accurately, and there is nowhere to cross over, so what on earth do you do? The answer is simple, and any fly angler can tell you it's time to get wet, dude! This is where you will begin to appreciate a good set of fishing waders and/or boots. Stores offer many brands, styles, and makes of these necessary pieces of equipment. You have a choice to make, and we want to make sure you are informed when you do, so here are some tips on the subject. 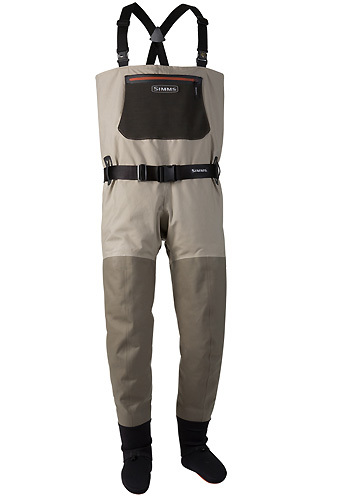 Fly Fishing Waders are available in waist-high or chest-high styles. The difference there is obvious, so let’s move on. There are also hip waders that only protect the legs.The next thing you want to consider is the type of foot desired. Fishing waders come in either stockingfoot or bootfoot types. Both types can be purchased in waist-high, chest-high, or hip styles. Stockingfoot waders have a neoprene "sock" at the "foot" end. These are designed to wear boots over them. 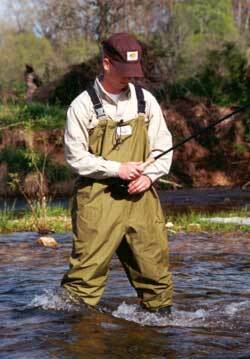 Generally a more comfortable style, stockingfoot waders are the pick of the litter. They pack up lighter and are easier to get into and out of. These are also more versatile in nature. Bootfoot waders actually have a boot attached at the foot end. The drawback is that they are heavy, hard to fold up, and are infinitely more difficult to get on and off. Sure, you avoid the cost of a pair of boots, but you lose the advantage in versatility.For one thing, when you wear a hole in the "bootfoot", you have to replace the whole thing. Then there are the hip waders that only cover the legs of the angler. These are dedicated to fishing in shallow waters that are not moving very quickly. These are the easiest to take on and off, but they DO only protect the legs and limit the depth of the water you can enter. Waders are made from either neoprene or a lighter, breathable material. Neoprene fishing waders keep the body heat in, and are useful in cold weather/cold water fishing. These waders are available in thicknesses from 3mm to 5mm, with the 5mm’s giving the most protection from the cold. If you are using these in warmer weather, you may find yourself uncomfortable very quickly. For warmer weather or water conditions, breathable waders are a wiser choice. These are made from interwoven nylon, or any one of a number of trademarked materials. A few examples would be Cabela's denier woven nylon, Hodgman's Horco-Tex , and the common Gore-Tex. The breathable waders are light weight, keep the water off of you, and allow your body heat to escape, so you stay calm, cool, and collected while you reel in that rockin’ rainbow! Prices for either type can range from under $100 , to as much as $450, so it is up to your budget and needs. I suggest that you go to your favorite outfitter and try some different types on for feel. How about kids and women? The really great thing is that all types of waders are also made for women and children. You will find these wherever you find your own waders, guys, so get the wife and the kids a set. After all, fishing is a family thing, too. There are others, but these brand names are the absolute, best quality, top of the heap ones out there. If you select a pair of stockingfoot waders, you will need a good set of dedicated wading boots or shoes. These boots and shoes are designed to get wet, dry fast, and keep the water off of your foot. They have either neoprene, rubber, or felt bottoms with non-slip technology. Some even have studded bottoms for added safety. Wading boots are made by a lot of the same makers that make the fishing waders. Good ones to look at are Orvis, Allen, Bite, Korkers, O’Neill and Proline. Of course Simms and Patagonia are in there as well, so they definitely deserve a look and a fitting. The only real decision you need to make is whether you want a low rise shoe or a high rise ankle boot. All varieties come in breathable versions and keep your feet dry and free of debris or sand. Materials can be anything from old school canvas to breathable Gore-Tex or nylon. Some feature zippered sides and some actually lace up. All will seal up and fit nicely over stockingfoot waders. The shoe types will come with a neoprene insert to wear them solo (when weather is REALLY hot!). Wading shoes/boots are a unisex item, so women just need to order two sizes smaller. As an example, say a lady wears a size 7 and wants a pair of wading boots. She would want to order a size 5 boot, since they are sized according to men’s sizes. This has never failed yet and is an accepted method everywhere. There are no half sizes, so if you need a half size, order the next highest size. Prices can range from as little as $59 to upwards of $200, depending on the brand and type you require. Try some on and see what works for you.